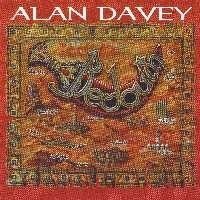 Hawkwind's second-longest surviving (but now ex-) member, bass master Alan Davey has put forth this second solo CD, amid the process of forming his own separate touring band. Presumably, 'Bedouin' the band also includes members Sean Massett (guitar) and another Hawkwind alum Danny Thompson (drums), who both appear on the album in limited fashion. In a live setting, I'd imagine this group would generally fit the power trio image, though the recurrent ambient breaks and Davey's love for the wave sequencers help give the band a second, more soothing direction. In this bipolar sense, we see that 'the proverbial apple never falls far from the tree' and since Davey was such a bit part of the Hawkwind sound over the last decade, it's not hard to point out the similarities. The rousing instrumental 'Rock Palace' kicks off the album in fine fashion, featuring the opening chunky Rickenbacker bass from Davey and then later, dueling synth and guitar solos, Massett adeptly filling the role once held by Huw Lloyd-Langton in the parent group. With Thompson apparently not yet completely on board, Davey mostly employs drum sequencers to act as surrogate. While the electronic drums are reasonably well handled, there's no adequate substitute for a live drummer, and the rock tracks all suffer some as a result. This becomes even more apparent by 'One Moon Circles,' where Thompson does appear and gives us one of his best performances, far superior to the linear 4/4-regimented beats of 'Black Sword' days. The 11-minute ambient piece 'Wadi Dhar' is a three-phase epic featuring more of Massett's soloing, and as the synths wash over the funky, syncopated beat, I'm reminded of the work of Chris Fournier (aka Fonya). 'Passion is an Animal' is one of only two songs with vocals, and would've fit in well with the Hawks' latest 'Distant Horizons,' though honestly, this track really doesn't grab me. However, it does feature some of Alan's most impressive lead guitar work to date. The other vocal track, 'Queen of the Night' is the far stronger tune and, along with the 'blanga' sounds of 'Space Rock Cafe,' should really benefit from a live setting. 'Bedouin' is in one sense a work-in-progress as it represents the founding of a new separate entity in its own right, with the 'Bass Assassin' No. 2 (to Lemmy, the original) now in charge. Here, Davey shows he's got the chops to effectively strike out on his own, and we should expect this to represent a mitosis of sorts, with two healthy entities emanating from one. Despite the initial personnel deficiencies, I can recommend this album to any true space rock fan, as it is a fine companion piece to Davey's previous solo effort, 'Captured Rotation,' recorded while he was still on board the mother ship.